The ISM non-manufacturing index posted a solid rebound in January after service sector activity took a breather in November and December. The headline rose to hit a new cycle high of 59.9. The improvement in new orders was the main driver of the recovery, but the breadth of positive responses across industries was also notable. The new orders index rose 8.2 points to a reading of 62.7 in January, which is the strongest since 2011. Business activity was up, measured by the business activity index and the tone of the comments in the press release. Many noted optimism stemming from the tax changes, and also that prices were picking up. Indeed, the non-manufacturing prices paid index rose on the month, following the manufacturing survey in pointing to a stronger price pressure environment. The Department of Labor also released the Job Openings and Labor Turnover Survey (JOLTS) for December. The number of available jobs open at the end of the year declined on the month, drifting further from its likely high-water mark posted in October. The hiring rate has yet to reflect much of a shift in trend. Turnover as measured by total separations rose despite a drop off in the number of layoffs. The number of workers that left their jobs voluntarily during the month was at its cycle high. That suggests a rising sense of optimism about job prospects elsewhere, which should also come with pay increases. The number of quitters jumped solidly but resulted in only a slight increase in the quit rate, or quits share of total employment, which remained bound in the 2.1% to 2.2 % range for the 12th month in December. The upswing in demand overseas along with the weakening of the US dollar has been an advantage for US exports, which rose 1.8% in December to their highest point on record. American demand propelled a 2.5% monthly rise in imports, which resulted in a larger than expected widening of the US trade deficit. The larger widening of the deficit in Q4 may result in trade taking a larger chunk off Q4 GDP than the 1.13% estimated in the advance GDP report. Still, the larger volume of trade between the US and the rest of the world is a positive for both domestic and foreign economies, even if it results in a slight drag from trade in the GDP calculations. Despite falling about 10.0% from highs reached in the final days of January, the S&P 500, Dow Jones Industrial Average and the NASDAQ Composite remain 13.0% to 20.0% higher on a year-on-year basis. The sell-off was likely spurred by fears of higher real interest rates, as last week’s strong January jobs report showed robust wage growth, lifting both market expectations for inflation and fed rate hikes. At 2.85%, the ten-year government bond yield hit a four-year high this week. With tax cut stimulus already expected to keep US growth above trend, there is little need for more stimulus. Yet, that is effectively what the federal government budget deal signed into law last week delivers. The $300 billion increase in the spending cap over two years could foster additional inflationary pressures at a time when the economy is already operating at close to full capacity. And, higher issuance of Treasuries could put further upward pressure on yields. Moreover, the plan could have a more material effect on growth than tax cuts, since consumers are likely to save a share of the disposable income accrued from tax reform. As market volatility surged, Fed speakers this week appeared unconcerned about financial market developments, instead choosing to reinforce their positive economic outlook. FOMC members had previously noted that equities were overvalued and therefore showed no sign of concern over the widespread sell-off. Voting members Dudley and Williams noted in speeches that wage inflation had picked up as expected and that markets are now adjusting to global monetary policy accommodation removal. This may help calm investor fears of faster rate hikes than previously expected, with the first of three hikes this year expected in March. The US has many key data in the pipeline for this week: retail sales, CPI, PPI, industrial production, Empire manufacturing, Philly Fed business outlook, housing starts and UniMichigan consumer sentiments. Similar key releases are also due in the Eurozone (industrial production) and the UK (retail sales, CPI, PPI). China external trade figures surprised on the upside but this could be just a blip skewed by seasonal factors. At the local front, exports decelerated more than expected to increase only 4.7% year-on-year in December, dragged by slower growth in both manufacturing and commodity exports. Declines in intermediate and consumption goods imports added to signs of softer growth outlook ahead. Overall exports growth of close to 20.0% in 2017 will unlikely repeat itself with single-digit growth pace expected in 2018 given a higher base effect last year, stronger currency and potentially lower CPO prices. Chinese stocks ranked among the biggest losers in last week’s global stock market sell-off as domestic benchmarks in China slid more than 10.0% from their most recent peaks, officially entering correction territory. Both the Shanghai Composite Index and Shenzhen A-Share Index dropped roughly 15.0% each from their latest peaks in late January. In previous sell-offs, Chinese state-backed funds have stepped in and bought shares to stem market declines, but there was little evidence of state-led buying this time. Many analysts attributed last week’s slump to Beijing’s increased tolerance for losses as the government presses on with a campaign to wring excessive risk-taking out of the financial system. The USD/CNY exchange rate continued to fall markedly at the beginning of 2018 (stronger CNY), in contrast to the consensus which was expecting a rise. The main reason for this was the USD’s general weakness in January. The effective, or trade-weighted, Chinese exchange rate has also strengthened somewhat, as the authorities have allowed the CNY to strengthen more versus the USD than the USD has weakened versus most other currencies. No China data is on the deck in the holiday-shortened week ahead of the Lunar New Year festivities. UK industrial production fell by 1.3% in December, after growing by 0.3% in November (revised from 0.4%). The consensus expectation for December was -0.9%. The monthly fall was the first since March 2017 and the largest fall since September 2012. However, the only downward contribution came from mining and quarrying, which decreased by 19.1%, following the shutdown of the Forties oil pipeline for a large part of December 2017. There were rises in the rest of the three main sectors, with manufacturing up by 0.3%, in line with the consensus estimate. Manufacturing output posted its eighth consecutive monthly rise; the last time that happened was between June 1987 and January 1988. 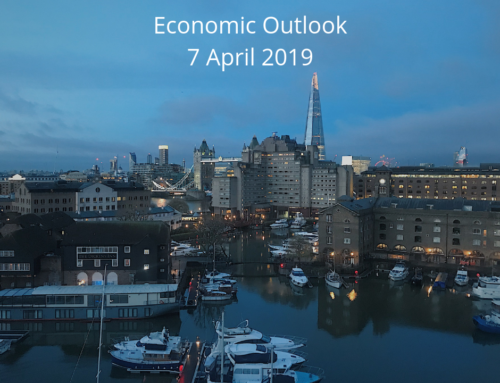 At its meeting during the week, the Bank of England (BoE) Monetary Policy Committee voted unanimously in favour of keeping the bank rate at 0.5%. However, in its inflation report accompanying the decision, the BoE warned that to bring inflation down toward its 2.0% target, it may need to accelerate interest rate hikes: “The Committee judges that, were the economy to evolve broadly in line with the February Inflation Report projections, monetary policy would need to be tightened somewhat earlier and by a somewhat greater extent over the forecast period than anticipated at the time of the November Report, in order to return inflation sustainably to the target.” UK inflation hit a five-year high of 3.1% in November but has since dropped to 3.0% in the latest reading. Following the BoE’s somewhat hawkish announcement, UK government bonds sold off, as some investors now expect that rate hikes could come sooner than previously anticipated. The European Commission upgraded its growth forecasts for the Eurozone to 2.3% and 2.0% for 2018 and 2019 (previous 2.1% and 1.9%), expecting a return to solid growth despite a slight moderation from the 2.5% in 2017. Officials from the Commission said “European economy has entered 2018 in robust health”, and the “unemployment and deficits continue to fall and investment is at last rising in a meaningful way”. Outlook on inflation remained subdued nonetheless, projected at 1.5% this year and 1.6% next year, still below the ECB’s 2.0% target, as subdued wage growth is expected to keep a lid on inflation. ECB also echoed the same in its monthly economic bulletin. European stocks plunged during a week of volatility and fears about the global ramifications of a broad stock sell-off in the US early in the week, the pan-European benchmark Stoxx 600 posted its biggest one-day percentage drop since June 2016. Despite a brief respite midweek, European stocks continued to slide as the week came to a close. The UK blue chip FTSE 100 Index, whose companies earn much of their revenue from outside the UK, dropped to a one-year low, hobbled both by the global rout in equities and a weakened pound. Germany’s DAX 30 and France’s CAC 40 were also weak. Banks, utilities, and energy stocks were notable laggards. In Europe, quarterly corporate earnings reported during the week were largely positive. China’s demand for European imports remained strong, and French industrial production rose more than expected in its latest reading. In Germany, Chancellor Angela Merkel finally hammered out a new government coalition between her conservative alliance and the left-leaning Social Democrats. Alas, investors shrugged at the news, as the German DAX and the euro barely moved following the announcement. Sources: Wells Fargo, TD Economics, T. Rowe Price, Handelsbanken Capital Markets, Hong Leong Bank.